This weekend was my last convention of 2016, so I thought I'd take a breather today and thank the awesome readers and inspiring creators I've met this year at Anime Los Angeles, Wondercon, Emerald City Comicon, Free Comic Book Day, Phoenix Comic Con, Small Press Expo, Comic Con Palm Springs, Santa Clarita Valley Comic Con, Phoenix Fan Fest, and Los Angeles Comic Con! I'm always looking for convention recommendations. Which are your favorites for meeting webcomic artists? Let me know in the comments! This week's vote image: NaNoMangO, a little comic community offshoot of NaNoWriMo, starts this month, and it's special to me because that's where Sombulus got its start way back in 2005. Vote this month to see original art from the very first versions of Sombulus I ever did! 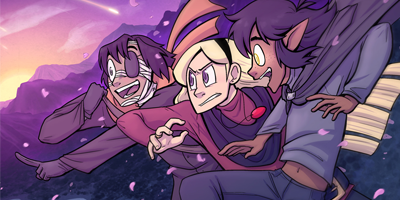 SpiderForest Comic of the Week is still going strong! Aww yeah! Castoff is about a lonely innocent bookworm with strange powers who longs to make a friend. Turns out there was a bounty on his head, and the no-nonsense bounty hunter who tries to collect on his name is in for a big surprise when his powers go haywire and strand them in a remote forest. Castoff comes with my highest recommendation for fans of super-fun characters and ridiculous antics and cute art. 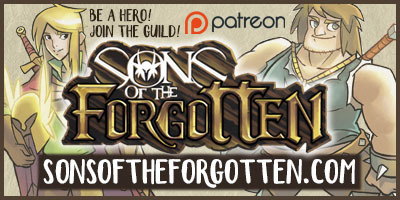 Sons of the Forgotten has juuuust started, and is following a young boy who dreams of becoming a hero. The art is so rich and detailed and I can't wait to see where it goes. A great one to start from the ground floor with!